The Friday storm should be minimal, meteorologist Dan Skeldon of The Press of Atlantic City said via social media Tuesday. 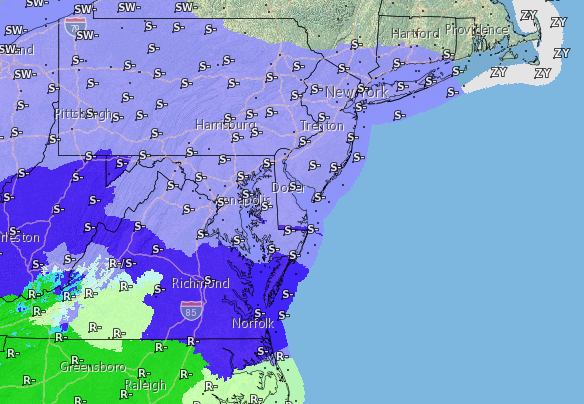 Temperatures will rise to 63 Wednesday and Thursday, but a cold front will usher in chillier air for Friday, giving the region its first chance of a March snowfall. “A mix of light rain and snow could produce some minor accumulations in areas where the light snow trumps the light rain,” Skeldon wrote. Rain could initially begin after 8 p.m. Thursday night, then change to snow in the early morning hours, a National Weather Service forecast said. The high for Friday is forecast to be near 40 degrees while the overnight low will dip to the low 20s. Cold air will remain in place Saturday (which is also the date of the Seaside Heights St. Patrick’s Day Parade) with a high of just 36 degrees. The storm track is uncertain, forecasters have said. Initially, a major New Jersey snowstorm was the subject of computer models, however the models have since backed off those predictions, bringing the storm system farther south and, thus, reducing New Jersey’s chances of receiving a major snowfall. The models, however, are still uncertain as to the final position of the storm, which would roll in during the evening to nighttime hours, possibly even after midnight, according to a forecast from the National Weather Service.